This ever-expanding collection contains e-books that support children from the early years through to the end of school. Conveniently grouped into collections for ease of access, topics include science, music, religion, history, literature, inventors and innovators, technology and biology. Britannica’s e-books can be accessed from any computer, tablet or mobile device, online or downloaded for offline use, enabling seamless access at school and at home. Through more than 2,250 articles, the Britannica Student Encyclopedia helps children gain a better understanding of the world. Children are sure to immerse themselves in the thousands of photos, charts and tables that help explain concepts and subjects, as well as 1,200 maps and flags from across the globe. For younger children, the Britannica Discovery Library is a charming, illustrated 12-volume set of “concepts and values” e-books. Children are introduced to various texts and genres, using a variety of digital resources including rhymes, narratives, puzzles and riddles. Key vocabulary words are highlighted throughout and defined at the back of each book. The set is ideal for pre-readers and early readers as each volume contains activities to build languages, critical thinking and comprehension skills. What types of e-books are in Britannica’s E-book portal? How do I access Britannica E-books? What special features are included on the Britannica E-stax platform? Can an individual leave notes in an E-book? What purchasing options are available for Britannica E-books? How will the Britannica team support my subscription? What types of e-books are in Britannica’s E-book portal? You will find an ever-expanding collection of texts that are appropriate for early childhood through academic level. Our non-fiction, informational texts cover languages, math, science, social sciences, sports, music, art and many other subjects. How do I access Britannica E-books? Britannica E-books can be accessed from the Britannica E-stax platform, where books can be browsed online or downloaded to use offline. Britannica E-books also work with other e-books platforms including Ebsco, Follett, Gale Cengage Learning, Mackin and Overdrive. What special features are included on the Britannica E-stax platform? 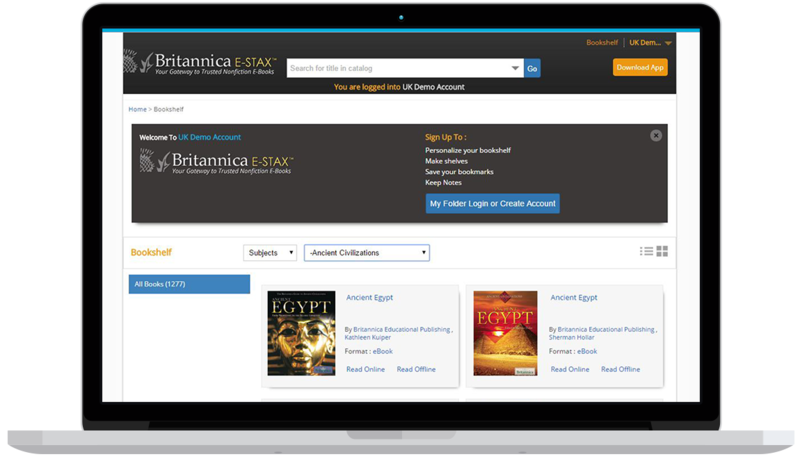 The Britannica E-stax platform includes apps for PC/Mac, iPad and Android tablets to support offline reading, cross-searching across all the Britannica E-books that your institution has purchased, free downloadable MARC records and free printing. Can an individual leave notes in an E-book? Yes, all of the E-books on the Britannica E-stax platform allow readers to create personal notes and highlights on any page and/or bookmark any page. Set up and log in to your ‘My Folder’ account to save and access personal notes and bookmarks. What purchasing options are available for Britannica E-books? Pricing options are available for unlimited simultaneous-user access and in perpetuity (full ownership) purchase. How will the Britannica team support my subscription? Britannica provides a range of online resources to help with the uptake and use of its resources; links can be found here. Britannica provides regular online webinars for new and existing customers; you can book these here. In addition, for new customers, we organise customer-specific online training tailored to meet your school’s specific needs. For any further questions, or to find out more about subscribing, contact us at enqbol@britannica.co.uk or +44 (0)20 7500 7800.